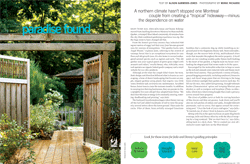 Eight years ago, when Julie Jonas and Danny Roberge moved from bustling downtown Montréal to Beaconsfield, Quebec, a tranquil West Island community 20 minutes from the city, their combined gardening experience was zip. But the bugs seemed to have changed that. From the home’s previous owners they inherited 929 square metres of soggy turf that every June became ground zero for swarms of mosquitoes. “Our garden backs onto the Angell Woods,” explains Julie, referring to the stretch of swampy forest that is an exceptional ecosystem for rare flora and old growth trees. It’s also home to several endangered species such as raptors and owls. “The old garden was your typical patch of green grass edged with annuals and cedars,” recalls Danny, who, with Julie, owns and operates an organic baked-goods company and a retail website for eco chic products. Although at the time the couple didn’t know the term, their design and direction followed what is known as xeriscaping, a form of desert landscaping that focuses on simple, elegant gardens using plants that require very little water, fertilizer and, as it turns out, maintenance. And added bonus: fewer insects come the summer months. In addition to running two thriving businesses, they are parents to Zia, a sprightly five-year-old girl they adopted from China. “We don’t have the time or energy to be constantly mowing, watering, deadheading and pruning,” says Julie. The backyard transformation began when Danny tore up all the turf and added a truckload of soil to raise the property several meters above the forest ground. which turns into a swampy flood plain each spring. Then came the rocks. Piles of them, from artfully arranged limestone boulders that a contractor dug up while installing an in-ground pool to the flagstones Danny laid. Most noticeable, though, are the narrow beds of tiny, multicoloured river rocks that meander throughout the entire property. A focal point are two winding wooden paths Danny built leading to the heart of the garden, a Pagoda-style tea house overlooking the elegant pool that seems made to fit the space. Encouraged by the noticeable reduction in bugs as soon as the sod and annuals were removed, Julie and Danny next hit their local nursery. They purchased a variety of hardy, ground-hugging perennials, including sandwort (Arenaria ssp.) and dwarf mugo pines that are thriving in the long hours of direct sunshine their garden receives each day. To fill out the mix, they added fast-growing, drought-resistant bushes (‘Summersnow’ spirea and weeping Siberian pea shrubs as well as junipers and brandons (Thuja occidntalis), which have intertwining boughs that create a privacy screen around their property. Low-maintenance ideas make upkeep simple. Develop a strong template. Julie and Danny’s well-planned layout means they don’t need to “reinvent the wheel” each year. Permanently anchor big pots for annuals (such as papyrus and coleus seen here). Just add tufts of shade grass (Hakonechloa macra ‘Aureola’) and stones for accents. Overwinter annuals if you can. Julie keeps the papyrus inside during the cold months, then replants them each spring. Group together plants with similar moisture needs to conserve water use. Give plants a deep soaking once every week or two and avoid frequent shallow waterings. Use organic mulch to prevent evaporation after irrigation and help soil retain water. “Mulch made from plastic and recycled tires just doesn’t cut it!” she says. Set plants in wells or dips in the ground and terrace off slopes to prevent water runoff. While some xeriscaping experts say, “Go native!” Williams demurs. “You have to be very careful with native plants; some are well-behaved, drought-tolerant and adaptable. Others can be invasive or simply die depending on the conditions.” Instead, she says to choose regionally appropriate plants (in terms of hardiness). “Recycling can actually create a pile of even more junk all made from recycled materials,” says Julie. “Instead, try to find creative ways to re-use things you have lying around the house.” Julie and Danny offer some tips. Repurpose garbage-bound items into garden accents. Danny inventively took a bamboo mat destined for the garbage and broke it apart to create a screen to hide pool equipment. The screen, which hangs in the window of the open tea house, helps block out the intense midday sun. Divide existing grasses and replant them in pots or in other sections of your garden rather than buying expensive new specimens. Living beside the Angell Woods, Julie and Danny have had to hold the mosquitoes at bay using a creative approach. Here’s how you can do it. Introduce flagstones in areas once covered by grass. This is a decorative yet practical way to create a drier microclimate. Do away with all bird baths. Mosquito larvae can grow in even small amounts of stagnant water. Hardscape around your pool with coloured cement and add wooden paths to help create a dryer microclimate. Add drought-tolerant plants that thrive through the natural rain cycles to help deter bugs that tend to gravitate to more fragile, succulent varieties.